3 of the Australian Offshore powerboats to compete in the 2016 Trans Tasman Offshore Challenge have arrived in New Zealand for the 4 New Zealand Trans Tasman Races. Hogs Breath Offshore Racing (Jim Harris & Paul Fowlds), Team 3 (Tom Barry-Cotter & Steve Jellick) and 222 Offshore Racing (Darren Nicholson & Peter McGrath) have cleared customs and are preparing their boats for the New Zealand races. Maritimo Offshore Racing will be joining the series as the 4thAustralian team member but will not get to round 1 and possible round 2. 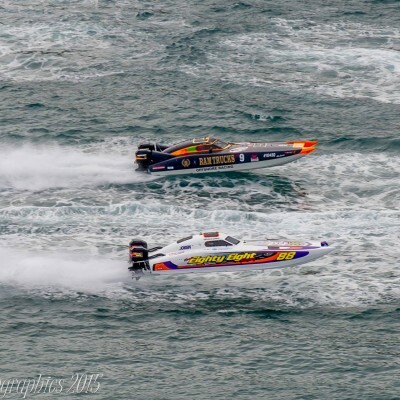 The Trans Tasman Challenge kicks off at Round 1 of the New Zealand Offshore Powerboat series at Lake Taupo, 31st January. Once the New Zealand races are complete the boats will be shipped back to Australia with 4 New Zealand team boats for the Australian leg of the Trans Tasman Challenge beginning at Bowen, 24th July. 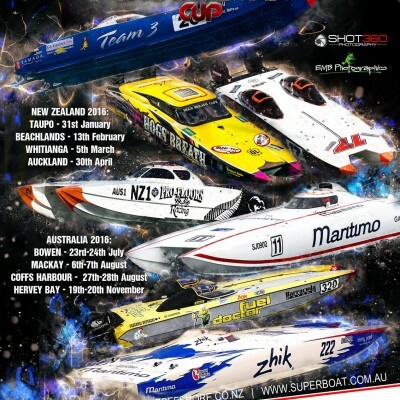 The Australian Offshore Superboat Championship consists of 6 events of which 4 are Trans Tasman races. We send our thoughts to Maree, Leigh, Jane and their families. 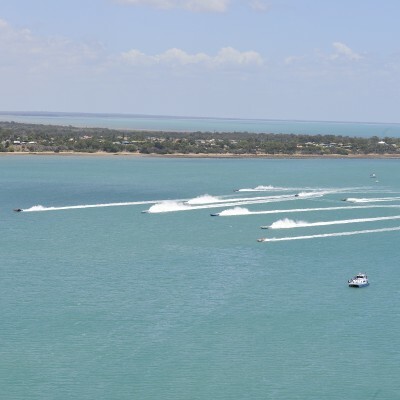 Teams have started heading to Hervey Bay for this weekends racing, the 6th and final round for the 2015 season, with both Supercat extreme and Supercat 600hp titles up for grabs teams will be fighting for points. The dry and wet pit area is at the carpark and jetty area Jetty Road, Urangan, This will be open to the public to come and see these amazing race boats up close and talk to the crew, teams are very happy to have a chat. Best viewing of the Pole Position shootout and races is the foreshore from Scarness to Torquay. Saturday will have the Pole Position shootout on between 12pm-12:45pm. Saturday afternoon will see the teams travel through the streets of downtown Hervey Bay in a street parade from 3:30pm. We would like to thank Fraser Coast Opportunities and Hervey Bay Boat Club for there support. Enjoy catch up from previous rounds. © Copyright 2018 Offshore Superboat Corporation, All Rights Reserved.